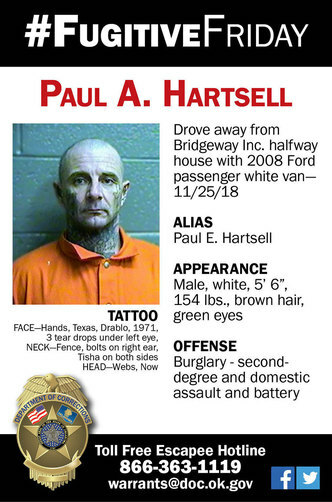 ODOC #FugitiveFriday: Paul Hartsell Jr.
OKLAHOMA CITY – Paul Hartsell Jr. walked away from a Ponca City halfway house on Sunday, stealing a van during his getaway. Hartsell, who walked away from Bridgeway Inc. at 620 W. Grand, is described as white, 5-feet 6-inches tall, weighing about 154 pounds, green eyes and brown hair. Hartsell was serving multiple Oklahoma County sentences for domestic assault and battery, and second-degree burglary when he walked away. He will likely face additional time for walking away and stealing the van, which the halfway house owned. The van is a white 2009 Ford E350 with a tag of IJN-414. It has a “No. 39” stickers on multiple locations on its body, as well as dents on its passenger side door. Anyone with information can call our escapee hotline at 866-363-1119 or email [email protected] All calls and emails are confidential.